Andy Pratt’s side know a bonus-point victory in London will secure second spot for the City Men regardless of what rivals Tonbridge Juddians and Henley Hawks do against Clifton and Old Albanian, respectively. The spotlight will also be on the relegation fight as teams look to guarantee their survival in the division. With London Irish Wild Geese and Guernsey already down, Birmingham and Solihull occupy the final spot in the bottom three and the Bees sit six points from safety. Pete Glackin’s side face a tough ask this weekend when they travel to newly crowned champions Rams RFC while rivals Dings Crusaders & Worthing Raiders meet in the West Country and Old Redcliffians host Redruth. Elsewhere in National Two South, Taunton Titans travel to Guernsey and Bury St Edmunds entertain London Irish Wild Geese. The beers will be flowing, the champagne will be chilling and their will be a party atmosphere at Old Bath Road this weekend when Rams RFC entertain Birmingham and Solihull. Seb Reynolds’ side were crowned champions of National Two South in Round 28 as they stormed to victory against Clifton and the Rams can now enjoy their final two games of the season as they prepare for life in National One. Whilst there may be a more relaxed atmosphere amongst the Rams, it is business as usual for Birmingham and Solihull. The Bees arrive in Berkshire six points adrift of safety and last weekend’s humbling home defeat against Barnes was a major blow to their survival chances. With play-off chasing Tonbridge Juddians to come following their visit to the champions, Pete Glackin’s side will be hoping the Rams will have their feet up as Birmingham and Solihull aim for a vitally important and positive result. The equation is simple for Canterbury. A bonus-point win over Barnes this weekend would see Andy Pratt’s side confirm their place in the National Two play-off after they battled past Bury St Edmunds in Round 28. The City Men managed to pull clear in the second 40 and their latest victory means they sit six points above their nearest challengers Tonbridge Juddians and Henley Hawks. Whilst there is still work to do for Canterbury to decide their destiny for this season, Barnes’ job has been done. The London-based side produced a superb display to beat Birmingham and Solihull away from home last time out and it means they will be playing in National Two South next term. After promotion back into this tier last year, Barnes have had a very satisfying return to this level and now they will be looking to put in another positive performance in their final home outing of the campaign. It was yet another excellent victory for Tonbridge Juddians last weekend. The third-placed side sealed their 11th consecutive victory away at Redruth and Peter Dankert’s men have now lost just once in their last 20 matches. It is a remarkable run TJs have put together, but they may still miss out on a top two finish if second-placed Canterbury don’t slip up this weekend. If the City Men were to struggle away at Barnes, TJs will be ready to pounce providing they obtain their desired result against Clifton in Round 29. As things stand, the visitors to the Slade occupy sixth spot and Clifton remain on course for their best finish for five years despite losing out to Rams RFC last week. In truth, the Lavender and Blacks were unfortunate not to pick up a single point in Round 28 and they will be hoping they can put that right on Saturday as they aim to nail down a top six spot. 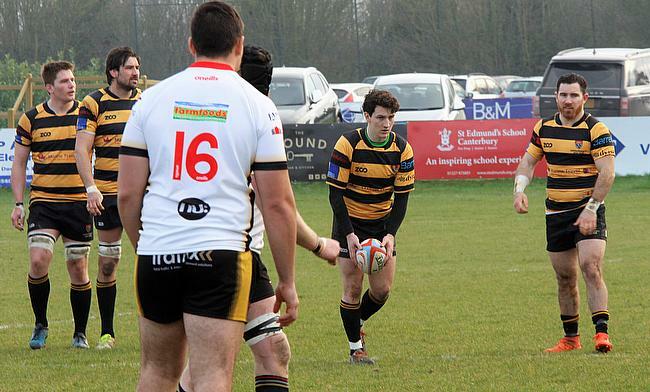 Henley Hawks are certainly not giving up on their National Two South play-off hopes. The evidence from their last two performances highlights their desire to sneak into the top two after ruthless displays against London Irish Wild Geese and Guernsey. Since the start of the month, Nigel Dudding’s side have scored 112 points and conceded just 28 so they will be looking to continue that sort of form when they visit Old Albanian. Speaking of scoring a large amount of points, Old Albanian’s Dan Watt was a prime example of this last Saturday. The fly-half accumulated 36 points against London Irish Wild Geese as James Buckland’s side returned to winning ways in some style. After a tough return to National Two South, OAs will be looking to end this season strongly and a home win on the weekend would be ideal as they continue to chase down a top six finish. It was Gary Kingdom to the rescue. Not for the first time this season, Taunton Titans’ ever-reliable full-back snatched a victory for the Somerset side and his victims last week were Dings Crusaders. Tony Yapp would have been pleased to end a three-match losing streak and his smile would have grown wider on Wednesday as sister Jo guided the University of Exeter to Twickenham glory in her final game in charge of her side. Tony will now be keen to round off a very successful week for his family when Taunton travel to Guernsey and the Raiders’ time in National Two South came to end last week. A long list of injuries has plagued their debut campaign at this level and Jordan Reynolds’ side had their fate sealed after losing to Henley Hawks. However, Guernsey have won three of their last four games and they will be eager to put in a positive performance in their penultimate home fixture of the campaign. Redruth may have suffered their third defeat in a row last weekend, but the injury hit side certainly put in a strong display against play-off contenders Tonbridge Juddians. Nigel Hambly’s side were firmly in the game until the final 20 minutes before TJs pulled away and the Reds will now dust themselves down as they prepare for a trip to Old Redcliffians. The Cornwall outfit are only three points off sixth place, while Old Reds are fighting for something a lot more significant; survival in National Two South. Saul Nelson’s men are almost there despite falling to a defeat against rivals Worthing Raiders last week. Old Redcliffians are now eight points above the bottom three so if they pick up three points or more from their home clash with Redruth, they will confirm a third successive year of rugby at this level despite just one win from their last six games. Four defeats on the bounce is not how Bury St Edmunds envisaged the final two months of the season is going for them, but the Wolfpack can take many plus points into Round 29. Nick Wakely’s side were beaten by Canterbury last time out, but Bury did make the play-off candidates work hard for their victory and it is that sort of grit and determination that might see the Suffolk outfit sneak into the top six. Currently, Bury are three points off Clifton with two games to go and they will fancy their chances of ending their mini slump against relegated London Irish Wild Geese this weekend. The visitors have shipped 113 points and scored just five in their last two matches and they will just want this season to come to a conclusion. However, the men from Hazelwood will also want to wave goodbye to National Two South on a high and a first victory since the beginning of February would be most welcome. Another campaign in National Two South is all but secured for Worthing Raiders after their crucial win against rivals Old Redcliffians last weekend. Jody Levett’s side picked up their first victory since the start of January and it means the Raiders are now 10 points clear of the drop zone with two games remaining. It would take something remarkable if Worthing were to be relegated from this position, but Dings Crusaders’ own fate is slightly more fragile. Luke Arscott’s men are just six point above the bottom three as they prepare to entertain Worthing in Round 29 after a heart-breaking loss against Taunton Titans last time out. Of course, Dings would have been massively disappointed but two bonus-points from their visit to Somerset could prove vital in their fight to stay in this division. The Crusaders can confirm their safety this weekend if they match or better Birmingham and Solihull’s result so can they complete the job in Bristol?